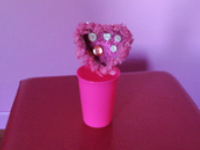 This tiny heart can be added to a drinking glass, a card, and so much more! 1. Gather your material. 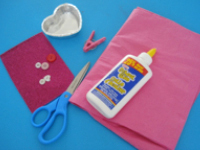 You will need pink tissue paper, a miniature heart-shaped aluminum cake mould, a small clothespin, shiny pink Fun Foam, scissors, white glue, and tiny red, white, and pink buttons. 2. 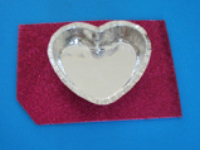 Trace the cake mould on the Fun Foam and cut out the heart shape. 3. 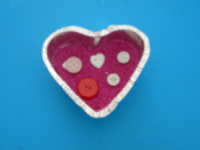 Glue the foam heart inside the cake mould. 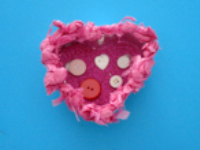 Glue the buttons on the heart. 4. Crumple several tiny balls of pink tissue paper. 5. 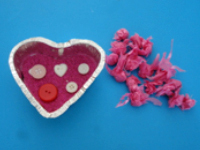 Glue the crumpled pieces of tissue paper around the edge of the cake mould. 6. 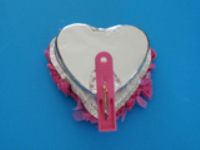 Glue the clothespin under the cake mould as shown. 7. 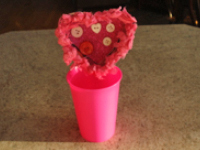 Use the clothespin to secure the heart on a drinking glass or another object to decorate it for Valentine's Day.